“This is the most stunning performance of the Rhapsody I’ve ever heard. Not only does the flow from beginning to end tie its ingenious form together into a perfect whole, but both the pianist and conductor allow you to hear every note. Subdin’s opening variations are pure quicksilver, till he makes the lovely transition to a more leisurely pace in variation 6. He digs out motifs buried in chordal arpeggios I never knew were there, he exposes the rhythmic underpinnings of passages normally heard only melodically, and in the famous variation 18 every piano note falls exactly into place, enabling you to relish the many counterrhythms and not just the rhapsodic melody. 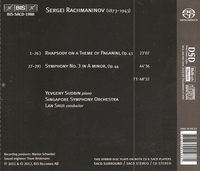 "BIS present two works composed by Sergei Rachmaninov, featuring virtuoso pianist Yevgeny Sudbin alongside the Singapore Symphony Orchestra under Lan Shui. Lan Shui and his Singapore Symphony Orchestra here follow their acclaimed 2008 recording of Rachmaninov’s Symphony No.2 (BIS SACD1712). The discography of Yevgeny Sudbin includes a Rachmaninov solo recital (BIS SACD1518), and a recording of the Fourth Piano Concerto (BIS SACD1728). Sudbin made his début on disc with a programme of sonatas by Scarlatti, but soon continued with recordings of music by later composers from his own country of birth, Russia. He has recorded the Tchaikovsky Piano Concertos No.1, Medtner’s Concertos Nos. 1&2 and Rachmaninov No.4. 2010 saw Sudbin’s return to the 18th century, with a Haydn recital that confirmed his reputation as a highly versatile musician. " "Lan Shui joined the Singapore Symphony Orchestra as Music Director in 1997. He has brought the SSO to greater heights during his tenure, through several international tours and recordings for the BIS label. Lan Shui is also passionate about performing music by Asian and Singaporean composers. Lan Shui is also Chief Conductor of the Copenhagen Philharmonic. He has conducted many orchestras including the Baltimore Symphony, Bamberg Symphony, Deutsche Radio Philharmonie, Frankfurt Radio Symphony, Stuttgart Radio Symphony, Calgary Philharmonic, Detroit Symphony, Houston Symphony, Deutsche Symphony (Berlin), Danish Radio Symphony, National Orchestra of Loire (France), Bern Symphony and Tampere Philharmonic. He has also performed at festivals including Tanglewood, Aspen, Bravo! Vail Valley, Round Top, Eastern Music, National Orchestra Institute and Casals Festivals. Born in Hangzhou, China, Lan Shui studied composition at the Shanghai Conservatory and graduated from the Beijing Central Conservatory, where he studied conducting with Xu Xin and Huang Fei Li. He made his professional conducting debut with Beijing’s Central Philharmonic Orchestra in 1986 and was later appointed Conductor of the Beijing Symphony. From 1986 he continued his graduate studies at Boston University and attended the Tanglewood Music Festival, where he worked closely with Leonard Bernstein. In 1990 he conducted the Los Angeles Philharmonic's Summer Festival, where he came to the attention of David Zinman who in 1992 invited him to the Baltimore Symphony Orchestra as Conducting Affiliate for two seasons. From 1994 to 1997, he was Associate Conductor to Neeme Jarvi at the Detroit Symphony. In the same period he assisted Kurt Masur at the New York Philharmonic, and worked with Boulez and the Cleveland Orchestra in Paris under the Young Conductors’ Project. Since 1998, Lan Shui has recorded over 16 CDs for the BIS label, including music by Arnold and Hindemith with the Malmö Symphony. Notable releases with the SSO include the first-ever complete symphonies of Tcherepnin and a Seascapes CD, which won a place in MusicWeb International’s 2007 Recordings of the Year. His album with the Danish Radio Symphony, Movement, was nominated for the 2008 Grammy Awards. He is the recipient of several international awards from the Beijing Arts Festival, New York Tcherepnin Society, 37th Besançon Conductors Competition in France, Boston University (Distinguished Alumni Award) and Singapore (Cultural Medallion)."